The anthropogenic global warming (AGW) theory of the IPCC is a fake science developed by the following scientists for fame & fund, causing huge economic losses to the world. President Trump made a scientifically right decision to withdraw the U.S. from the Paris Agreement and will liberate mankind from the AGW scam. The AGW theory is based on 1D radiative-convective model (RCM) giving the uniform warming of 1.2-1.3°C throughout the troposphere and the surface when greenhouse effect (GHE) increases with CO2 increase from 300ppm (1xCO2) to 600 ppm (2xCO2) by Manabe (1967) and Hansen (1981) (see Case B in Fig.1). The lapse rate of 6.5C/km is defined for 1xCO2 in the U.S. Standard Atmosphere (1962). There is no theoretical guarantee, however, that the same lapse rate will be maintained in the perturbed atmosphere with 2xCO2 because it depends on radiation, convection, large scale dynamics and moisture etc. Therefore, the lapse rate for 2xCO2 (LR) is a parameter requiring a sensitivity analysis as shown above. 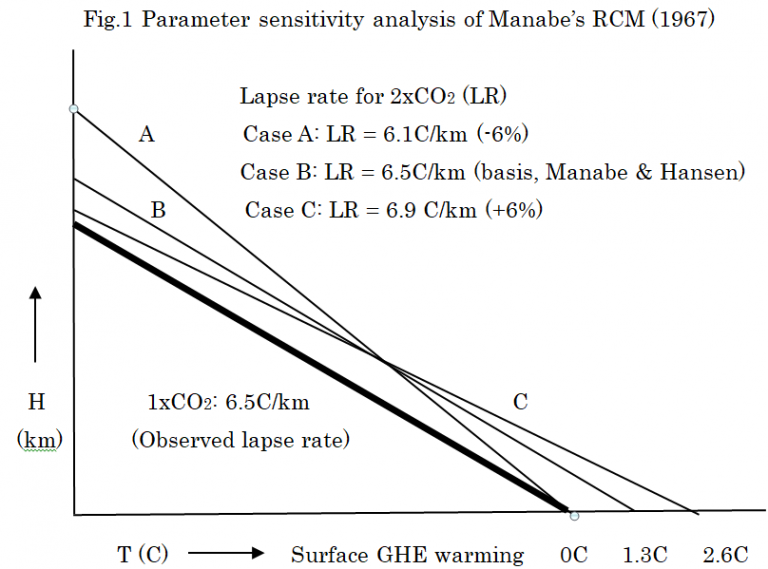 In Fig.1, the surface GHE warming varies as much as 100% with a LR variation in only 6%, while the lapse rate generally varies from 4°C/km to 10°C/km in the atmosphere. Therefore, the surface GHE warming of 1.2-1.3°C is theoretically meaningless though it is utilized in all general circulation models (GCMs) of the IPCC. Eeff: the emissivity of the earth-atmosphere system. (a) At the surface, there are evaporation Fe and conduction Ft, being missed in (1). (b) Equation (3) shows the GHE increase for 2xCO2 raises the upper troposphere temperature Tu instead of Ts because the OLR is governed by the Fu. The surface GHE warming of 1.2°C, however, has no theoretical basis as shown above. 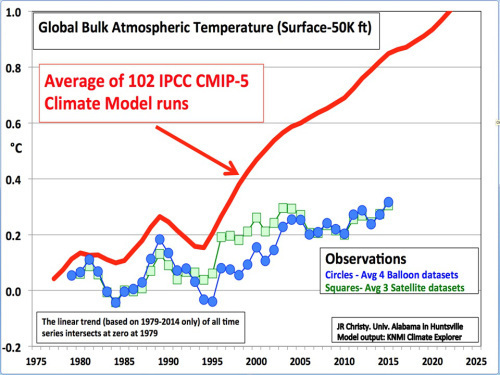 Actually the 102 GCMs studies showed much larger troposphere temperature increase than observations with balloon and satellite in the model comparison project (CMIP-5) for the IPCC 5th Assessment Report (2013) as shown below. Then, real climate sensitivity is around 0.15C at the surface because the amplification factor is 1.0 in this case. Kimoto (2015) obtained the surface climate sensitivity of 0.14-0.17C which was coincident with the observed climate sensitivity of 0.11-0.24C in five papers. Hansen (1984) showed that 3D climate models utilized the surface GHE warming of 1.2-1.3C from the RCM studies by Manabe (1967) and Hansen (1981). Weart: This was a radiative convective model, so where’s the convective part come in. Hansen: Yes. So it’s a fudge. That’s why you have a 3D model to do it properly. In the 1D model, it’s just a fudge, and you can choose different lapse rates and you get somewhat different answers. So you try to pick something that has some physical justification. But the best justification is probably trying to put in the fundamental equations into a 3D model. By the 2020s, according to NASA’s calculations, the average annual temperature across much of the United States will have risen by 9 degrees Fahrenheit or more. – Cess, R.D., J. Atmospheric Sciences, 1976, 33, 1831-1843. – Dorland, R.V. et al., 2006. KNMI Report 50010200, 99-101. – Hansen, J. et al., Science 1981, 213, 957-966. – Hansen, J. et al., Analysis of feedback mechanisms in Climate Processes and Climate Sensitivity, J.E. Hansen and T. Takahashi, Eds. (American Geophysical Union, Washington, D.C., 1984), pp. 130-163. – Hansen, J. et al., Atmos. Chem. Phys., 2016, 3761-3812. – Kimoto, K., Energy & Environment, 2015, 26, 1055-1067. – Manabe, S. and Wetherald, R.T., J. Atmospheric Sciences, 1967, 24, 241-259. – Schlesinger, M.E., Climate Dynamics, 1986, 1, 35-51. I do hope that AGW believer (for that is all he has) seb is reading this. And the true believer in climate modelers, david russell, see this. You really do believe those things to be true, do you? For example, do you think that figure 3 from Christy is showing correctly the spread between models and reality? You and you alone are responsible for everything you do and everything that happens to you! Unless you believe a computer model is better at laying out your future for you? Well do you? I don’t have to believe or not believe. got their much trumpeted research wrong. Or do you believe (for that is all you have) they all got it correct? Do you sit at the fat end of scientific complacency believing that the science is all settled? You have produced ZERO EVIDENCE that CO2 causes warming in a convective atmosphere. Why do you keep AVOIDING that issue.???? FAR better than anything from the AGW con-artists that you seem to worship..!! And in your second graph, the current temperature is now about where the 2 in 2016 is. NOT ONE of the models is within cooee of being correct. The models have more than 100 tunable parameters.You can do anything to fit model output with obsereved temperature time series. Therefore,the point is that the AGW theory is based on the theoritically erroneous papers of Manabe(1967),Cess(1976),Hansen(1981) and Schlesinger(1986). If you want to study them, I will send you the PDF of these papers. The greenhouse theory can be tested by examination of several planets, which provide an ensemble of experiments over a wide range of conditions. The atmospheric composition of Mars, Earth, and Venus lead to mean radiating levels of about 1, 6, and 70 km, and lapse rates of ~ 5°, 5.5°, and 7°C km, respectively. Observed surface temperatures of these planets confirm the existence and order of magnitude of the predicted greenhouse effect. I fail to see how Hansen could write that Mars, Earth, and Venus confirm the theoretical greenhouse effect when Mars has an atmospheric composition of 95% CO2 (950,000 ppm) compared to the Earth’s 0.04% (400 ppm), but yet Mars is about 75 degrees C colder than Earth. The temperature of the planets can be explained predominantly by two parameters: (1) atmospheric pressure/density and (2) distance from the Sun. Mars has an atmosphere that is about 100 times less dense than Earth’s, and it’s further away from the Sun than Earth. Venus’ atmosphere is about 90 times more dense than Earth’s, and it is closer to the Sun than Earth. Like Mars, CO2 makes up about 95% of its atmosphere. Therefore, the Venusian temperature can also be explained by these first two parameters. The CO2 concentration of Mars (950,000 ppm), Venus (950,000 ppm), and Earth (400 ppm) would appear to have little to do with planetary temperatures relative to (1) and (2). Our analysis revealed that GMATs [global mean annual temperatures] of rocky planets with tangible atmospheres and a negligible geothermal surface heating can accurately be predicted over a broad range of conditions using only two forcing variables: top-of-the-atmosphere solar irradiance and total surface atmospheric pressure. A key entailment from the model is that the atmospheric ‘greenhouse effect’ currently viewed as a radiative phenomenon is in fact an adiabatic (pressure-induced) thermal enhancement analogous to compression heating and independent of atmospheric composition. Consequently, the global down-welling long-wave flux presently assumed to drive Earth’s surface warming appears to be a product of the air temperature set by solar heating and atmospheric pressure. Glad you mentioned ‘pressure’ as it seemed distinctly lacking in these (so-called) scientists’ thinking. For pressure induced temperature, think diesel engine. Probably the 2nd biggest application of that on the planet after the atmosphere itself. Because you still don’t understand how the greenhouse effect works. For you, it’s apparently just “there is some CO2 and that warms the planet and the amount of warming depends on the CO2 concentration” … right or wrong? And for the 1000th time, pressure doesn’t cause any warming. Planets with atmospheres are not closed systems! Has it ever occurred to you that the pressure and temperature gradients are not causes but effects instead? Mars’ atmosphere is made up of 950,000 ppm CO2. Venus’ atmosphere is made up of 950,000 ppm CO2. So explain specifically why Venus is 537 degrees C warmer than Mars without using the (1) atmospheric pressure/density explanation (Venus’ atmosphere is many orders of magnitude denser/more pressurized than Mars’ atmosphere) or (2) distance from the Sun explanation. Then, explain why Mars is -75 degrees C colder than Earth despite having 950,000 ppm atmospheric CO2 (95%) to Earth’s 400 ppm (0.04%) CO2 without using the (1) atmospheric pressure/density explanation (Earth’s atmosphere is 100 times denser/more pressurized than Mars’ atmosphere) or (2) distance from the Sun explanation (Earth is closer to the Sun than Mars). Wrong. You have again demonstrated that you are intent on making up positions/thoughts that I (or others) don’t have. Um, I didn’t write that atmospheric pressure/density gradients cause warming. The Sun causes warming. The atmospheric density/pressure is a significant determinant of how much of that solar heat is retained vs. released. Who has written that “pressure and temperature gradients” are causes? You just wrote: “Mars’ atmosphere is made up of 950,000 ppm CO2. Venus’ atmosphere is made up of 950,000 ppm CO2. So explain specifically why Venus is 537 degrees C warmer than Mars” and “explain why Mars is -75 degrees C colder than Earth despite having 950,000 ppm atmospheric CO2 (95%) to Earth’s 400 ppm (0.04%) CO2” , didn’t you? You seem to be under the impressing that AGW proponents think that the greenhouse effect is solely depending on the CO2 concentration. And because that is not the case there can’t be a greenhouse effect. You have no idea how the greenhouse effect works, do you? It’s not an energy source. That’s also called “causes warming”. Everything that causes an increase in heat content is causing warming. You … “density/pressure is a significant determinant” . P.S. : I expect you (from now on) to repeatedly demand an answer to your little assignment to explain why Venus and Mars are at their respective temperatures without using the pressure or distance to the Sun. I won’t do that until you have shown that you understand how the greenhouse effect works (which should answer your request). No. I don’t use the word “solely”. That would imply that I think AGW proponents do not agree that water vapor and cloud are components of the greenhouse effect. I don’t think that, and have never written that. On the other hand, NASA’s Gavin Schmidt believes that the IPCC has concluded that 110% of the temperature changes since the mid-20th century are caused by humans, predominantly CO2. Therefore, Schmidt and the IPCC have concluded CO2 is the dominant factor in both the greenhouse effect and planetary temperature changes. Water vapor and cloud factors are largely ignored or treated as non-significant to the temperature change despite their rather large role in the stated greenhouse effect. Notice I didn’t write that I think AGW proponents believe CO2 is the sole or only factor involved in the greenhouse effect. I refrain from using exclusive, either/or, 0%/100% dichotomies in my word choices. That’s why I am so annoyed when you repeatedly make up statements using this language. I understand, though, that this is a debating tactic of yours. So you are not likely to stop employing it. That’s not how heat generation works. The act of pulling a blanket over a loaf of warm bread does not mean that the blanket produces or generates heat. The blanket prevents existing heat (from a heat source [the oven]) from escaping so easily so the warm bread stays warm longer. Caves are the same temperature year round, much warmer in winter and much cooler in summer. They are not warmer in winter because caves are actively heating the air. You … “density/pressure is a significant determinant”. You purposely truncated the rest of that. I wrote that density/pressure is a significant determinant of how much of the Sun’s heat generation is retained or escapes. The density/pressure of atmospheres doesn’t generate heat itself; it prevents/allows the heat generated by the Sun to escape. Your attempts to play these “Gotcha!” word games are beneath you, SebastianH. It would be appreciated if you would conduct yourself in a more adult-like fashion. I don’t expect you will ever answer the questions asking you to explain Mars/Venus/Earth temperatures without using solar distance or atmospheric pressure/density factors. Of course, since both Mars and Venus lack water vapor, and water vapor is an essential component of the GHE on Earth, perhaps you could explain what other GHG is significantly involved in the GHE on Mars and Venus besides CO2. But again, I don’t expect that you will answer, as you know that by doing so you undermine your case. No. I don’t use the word “solely”. … to be able to wiggle yourself out of every corner your contradicting logic puts you in? The way you phrased your question makes it clear what you think and the level of your understanding of the greenhouse effect on this planet and on other planets. That doesn’t leave much to the imagination. The density/pressure of atmospheres doesn’t generate heat itself; it prevents/allows the heat generated by the Sun to escape. See, you are able to understand concepts like this. So instead of density/pressure which can not retain any heat by themselves insert “the presence of greenhouse gases” into your statement and voila. Or can you explain how density/pressure would be able to do what you state it is able to do? And can you explain why density/pressure is the determining factor and the composition of an atmosphere isn’t? Your attempts to play these “Gotcha!” word games are beneath you. Says the one who is constantly nitpicking on the words used and wrongly summarizes what others say either intentionally or because he didn’t understand it. Learn and understand what the greenhouse effect is, and you’ll be able to answer this for yourself. Uh, no. Because I understand that water vapor and cloud are significant/primary factors in the Earth’s greenhouse effect. So I wouldn’t write that CO2 is “solely” responsible for the greenhouse effect as you have (again) falsely claimed I have. You insert words in your made-up comments that I don’t use, and then when I point out that I didn’t write what you claimed I did, you say I’m trying to “wiggle out” of saying what you falsely claimed. It’s pathetic, actually. So the density/pressure of atmospheres does not allow/prevent heat from escaping…without greenhouse gases? What greenhouse gases are present on Mars and Venus besides CO2, SebastianH? And why do you think Mars and Venus both have 950,000 ppm CO2 in their atmospheres, but Mars is 537 degrees colder? What causes that difference when they have the same amount of CO2 in their atmospheres? It’s not “nitpicking” to point out that I have never said that CO2 is the “sole” greenhouse gas in the Earth’s atmosphere. Instead of making up statements, why not do the civil thing and put my actual words in quotes and then respond to them? Both Mars and Venus have atmospheres with 950,000 ppm CO2…and no water vapor. Venus is 537 K hotter than Mars is. Explain the temperature difference while not using atmospheric pressure/density gradient or the planets’ distance from the Sun in your explanation. What causes that difference when they have the same amount of CO2 in their atmospheres? What greenhouse gases are present on Mars and Venus besides CO2, SebastianH? That’s easy enough to look up, isn’t it? So I wouldn’t write that CO2 is “solely” responsible for the greenhouse effect as you have (again) falsely claimed I have. You and your word games. I never claimed you have written “solely”. Instead of making up statements, why not do the civil thing and put my actual words in quotes and then respond to them? I know you like quotes and are good at cherry picking the relevant ones to support your views, but sometimes you have to understand the meaning and intentions too … you regularly fail at doing so. I didn’t write that you think that we (AGW proponents) think the greenhouse effect depends solely on CO2. I wrote it “CO2 concentration”. As is evident in the first quote in this reply and the last paragraph of your comment you seem to think that equal concentration must mean equal greenhouse effect (if it would exist) or something in that direction. I once again suggest you learn about the greenhouse effect and how it works (the mechanism) and try to understand it. That would be really helpful. Let’s imagine we (the AGW proponents) made it all up, do you think we would be so sloppy and include inconsistencies into our “theories”? The greenhouse effect (of CO2) works the same on Mars, Venus and Earth … you can continue to disagree, but please don’t argue against something you don’t seem to understand. P.S. : And maybe you just omitted a word or wrote that without care, but same concentration does rarely mean the same amount. Why the dishonesty, SebastianH? Do you think you can just deny you wrote something and we’ll just believe you? With your track record? I didn’t and don’t use words like “solely”. You falsely (dishonestly) claimed I do/did. And now you’re denying you even wrote that in purposely mischaracterizing my position. Is it any wonder that you don’t have a reputation as an honest person here, SebastianH? Oh. My. God. You wouldn’t be claiming that the reason why Mars is 537 K colder than Venus is because it’s atmosphere is 96% CO2 vs. Mars’ 95% CO2? You wouldn’t…would you? So then explain why Earth is 75 degrees warmer than Mars despite Mars having 950,000 ppm CO2 in its atmosphere vs. Earth’s 400 ppm without using the atmospheric pressure/density or distance from the Sun in your explanation. Mars has no water vapor. So what are the other GHGs besides CO2 on Mars? And you still have yet to explain why Mars is 537 K colder than Venus despite both planets having about 95%-96% CO2 in their atmospheres and no water vapor, the main greenhouse gas (on Earth). Explain that temperature difference without resorting to the pressure/density or solar distance in your explanations. How many more times are you going to be avoiding this question? Your I won’t answer because you don’t understand how the greenhouse effect works evasion is rather weak and unbecoming of a 35-year-old man. It’s not like we don’t know why you refuse to answer this. “but please don’t argue against something you don’t seem to understand. says seb, who’s grasp of real science an atmospheric physics is akin to that of a hamster !! Everyone is STILL WAITING for you to answer question on the very basis of your FAKE AGW religion. Waiting for empirical proof that CO2 has any warming effect on oceans or our convective, moist atmosphere. Been waiting a LONG, LONG time, haven’t we seb . CO2 greenhouse effect doesn’t exist on Mars, Venus or anywhere else. Temperature control is ALL down to the gravity thermal gradient and incoming energy. GET USED TO IT !!! MAGIC is hard to explain, isn’t it seb. Especially when you have absolutely ZERO empirical data to back up any fantasy warming, even on Earth. Your total LACK of understanding of atmospheric process must be a total embarrassment to you. Has it ever occurred to you that the so-called “greenhouse effect” is an effect of the pressure temperature gradient ?? Or do you wish to remain WILFULLY BLIND. Question: where does the temperature gradient start from? The surface or from some point in the atmosphere downwards? In the case of the latter, what is the process of choosing the height it starts from? How does that work? Dazed and confused as always. You KNOW the pressure/temperature gradient exists. Answer the question ! have you ever got out of your brain-washed thought bubble and actually look at any real science of how the atmosphere works?? Seem that you are incapable of anything resembling actual rational thought. Why are you evading that simple question, AndyG55? Why are you STILL evading proving one iota of proof of CO2 warming of oceans or convective moist atmosphere, seb. You have ALWAYS evaded this question. If you don’t know how the gravity thermal gradient operates, its time for you to go and re-learn basic physics. You seem to have missed out big time in junior high. Oh I know how it is supposed to work. However, I am asking you a simple question trying to confirm something. So would you be so kind and give me an answer? Where does the temperature gradient start from? The surface or from some point in the atmosphere downwards? In the case of the latter, what is the process of choosing the height it starts from? Back to junior high for you, seb ! I’ve tried teaching you before, but you have proven that you are incapable, and I’m NOT going to waste my time. Your continual display of your total lack of any sort of knowledge of the atmosphere ASTOUNDS even me. !! Its as if you live in an anti-knowledge FANBTASY land. So seb thinks the pressure temperature gradient is an effect of CO2. We really are getting to the TOTALLY BIZARRE range of his fantasies now. !! goofed up my html tags yet again !!! sorry. Yes seb. they are effects of GRAVITY. That is where the gravity/thermal effect come from. You really are WAY behind the eight ball, aren’t you. !! And for the 1000th time, pressure doesn’t cause any warming. If as you say CO2 controls atmospheric pressure, which one of your unverified models shows that? Or is this a new theory? I didn’t say that. Stop making up things I didn’t say. So, what is the pressure and temperature gradient an effect of, seb?? You KNOW its an effect of gravity, don’t you. So why did you bother with such a ridiculous statement? It’s an effect of gravity, convection and the radiative properties of greenhouse gases. The resulting temperature gradient starts where? At the surface or at some height in the atmosphere? Simple question, simple answer. Don’t evade! That was my point. But I understand YOU can not appreciate it. Why are you CONTINUALLY evading producing one tiny bit of proof of CO2 warming. You have been squirming around your total inability to provide empirical proof for a long, long time , seb. If you don’t understand how the gravity-thermal physics operates, then you are obviously LACKING in basic physics from junior high level onwards. I don’t have time to take you back to junior high, get rid of all the anti-science junk in you brain-washed little mind, and teach you from scratch. You will just have to remain, as always. monumentally ignorant. ONLY H2o in the lower atmosphere. But you KNOW that, don’t you seb. And no the actual pressure gradient is NOT affected by radiative gasses, only the temperature gradient and ONLY by H2o. FFS, go and learn some basic facts about the atmosphere. You are a total embarrassment to yourself, and I’m sick of trying to amend your manic misrepresentations, through ignorance, of the physics. Sorry, chatbot_SebH, but you are [snip], not because you are wrong, but you are wrong in the face of overwhelming evidence against you’re strongly held false beliefs. I’ve posted this link at least twice in the past, so you had opportunity to read it, but either chose not to or decided that facts be damned. 9000 kPa atmospheric pressure would occur on earth at an altitude many miles below sea level. No such place exists, but if it did – it would be extremely hot, like Venus. Please make a note of it this time, and don’t make that stupid mistake again. Hyperventilating indeed … you believe in what those websites write? Why? What gives credibility to what has been written there versus what can be read on other websites? If you really think the current situation on Venus has nothing to do with CO2, explain (in detail) why it is hot on Venus’s surface then. How much of the solar radiation reaches the surface? Or are you a believer of the theory that pressure in an open system can somehow cause the temperature to increase permanently? Why aren’t fire extinguishers hot then? Yet again, seb displays his abject WILFUL ignorance of atmospheric processes. TOTALLY UNABLE to come up with even the remotest hint of any actual proof. Stop the child-minded attention seeking, seb. It makes you look even more pathetic each time. did you notice the article on WUWT showing the MASSIVE BENEFITS of enhanced atmospheric CO2. So far you have been totally unable to come up with a single provable downside. Pretty SAD sort of brain-washed FANTASY that you are stuck in, isn’t it, poor gullible little child-mind . “you believe in what those websites write?” – chatbot_SebH, the tedious one. “explain (in detail) why it is hot on Venus’s surface then.” – same science challenged chatbot troll as above. READ THE ARTICLE AT THE LINK!!! I read the link, the author claims that the lapse rate determines much of Venus’s surface temperature. A lapse rate in atmospheres can not exist without gases that can absorb/emit LW radiation (causing warming at the bottom and cooling at the top) and therefore is an effect, not a cause. Additionally, they write about the forcing effect of doubling CO2 and apply the same formula that is used for Earth on Venus. That completely ignores that 960000 ppm CO2 on Earth wouldn’t be as much CO2 as is Venus’ atmosphere and the different base temperatures. So if you get a forcing of 3.7 W/m² for a doubling here on Earth that means the back radiation from CO2 will increase by this amount. This would be dependent on the surface temperature because back radiation from CO2 just radiates back and CO2 doesn’t radiate by itself. Stop making unsupportable junk-science CRAP up. Stop DENYING that the gravity based thermal gradient exists and is PROVEN by measurement on all atmospheric planets. and STOP DENYING that you are TOTALLY UNABLE to support your CO2 atmospheric warming junk science. AndyG55, may I suggest you provide copy/pastes to sources such as the following rather than using snippets and all-caps and insults and exclamation points when responding to posts like SebastianH’s? It’s much more substantive and readable. Let him attempt to “debunk” these real scientific analyses, as otherwise he is apt to just ignore your comments and assume you have nothing to back up what you write. I have plenty more of what’s available below. If you would, put sources such as these in a database and copy/paste them into your comments. This is just a suggestion (that I really hope you will at least consider), as I think responding with links and sources would elevate the quality of these comment boards. Driving people away by “yelling” at them does not advance the discussion. The climatologists derived the theoretical foundation of the greenhouse hypothesis from the concept of radiative equilibrium over the entire gas area of the atmosphere, right down to the earth’s surface. But the fundamental premise of radiative equilibrium – a balance of incoming and outgoing radiation – is correct only as long as it is limited to the vacuum-like zone of the upper atmosphere. In the lower regions of the atmosphere, the heat balance is essentially determined by thermal, i.e. thermodynamic equilibrium, which includes the thermodynamic characteristics of the components of the atmosphere as well as their changes in status. From the upper atmosphere down to earth’s surface, air pressure rises continuously. The determinant of atmospheric pressure is the mass and the weight of that part of the atmosphere above the point in question. And as pressure increases, so does temperature. The rise in temperature is caused by the thermodynamic characteristics of the main components of the atmosphere, i.e. N2 and O2. Everyone knows that compression causes gases to warm: the effect is noticeable even when inflating bicycle tires. The atmosphere is no different. Estimates of the effects of CO2 concentrations on air temperature are often – as mentioned before – derived from conditions on Venus. If one assumed that the atmosphere of Venus was similar to that of the earth, rather than being 95% CO2, and that it still had a pressure of 90 bar, then the surface temperature would be about 660°C, i.e. about 200°C more than at present. The difference arises from the somewhat smaller k value for triatomic as against biatomic gases (k Air: 1.4; k CO2: 1.3). Thus it would actually be somewhat colder on earth if our atmosphere consisted of CO2 rather than air. Here, using a different approach, it is shown that GE [the greenhouse effect] can be explained as mainly being a consequence of known physical laws describing the behaviour of ideal gases in a gravity field. A simplified model of Earth, along with a formal proof concerning the model atmosphere and evidence from real planetary atmospheres will help in reaching conclusions. The distinguishing premise is that the bulk part of a planetary GE [greenhouse effect] depends on its atmospheric surface mass density. Thus the GE can be exactly calculated for an ideal planetary model atmosphere. A previously-overlooked mechanism for energy transmission throughout the atmosphere is presented and characterised. This mechanism, which we have named pervection, involves the transmission of mechanical energy through a mass – in this case, the atmosphere. It is distinct from convection in that it does not require mass transport. It is also distinct from conduction in that conduction involves the transmission of thermal energy, not mechanical energy. 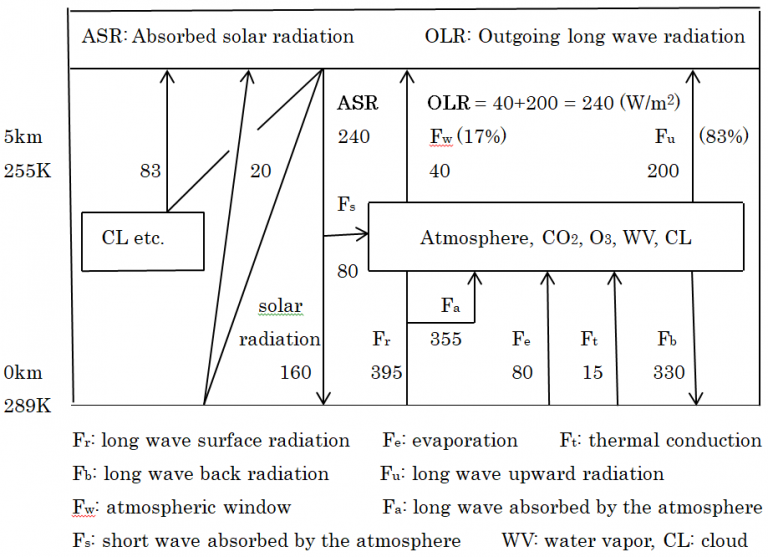 The current atmospheric models assume that energy transmission in the atmosphere is dominated by radiation and convection, and have until now neglected pervection. Experiments were carried out to measure the rate of energy transmission by pervection in air. It was found that pervection is rapid enough (up to at least 39.4 ± 0.9 m s−1 ) to ensure the troposphere, tropopause and stratosphere remain in thermodynamic equilibrium. This contradicts a fundamental assumption of the current atmospheric models which assume the atmosphere is only in local thermodynamic equilibrium. Everyone knows that compression causes gases to warm: the effect is noticeable even when inflating bicycle tires. The atmosphere is no different. “Everyone knows” that an inflated bicycle tire doesn’t stay warm. It’s not a closed system and neither is the atmosphere. It is constantly losing energy towards space. There is no mechanism that can increase and keep temperatures by applying more or less constant pressure in such an open system. As “everyone knows” this is incorrect. At the end, the author asks a question about the difference between highest temperatures on the Moon (130°C) and on Earth (80°C) and how it’s possible that Earth is cooler than the Moon in this regard, even though we are supposed to have a warming GHE. That question just highlights the author’s ignorance about atmospheric mechanisms and how the Sun’s radiation heats the surface. Another “the lapse rate begins at the top” paper (full of exceptions and based on thought experiments confusing cause and effect)? Possible first question to the author would be: what happens if someone would artificially heat the surface of the planet? Would the starting point height at the top change? How could it do that if the mass of the atmosphere doesn’t change? The author is also assuming Earth to be a closed system even though he mentions it’s not. Very weird “paper”. What’s really not surprising – but nonetheless interesting to watch – is how predictable your responses are. Essentially your “refutation” of analyses that contradict the paradigm you hold dear is summed up using your words “As ‘everyone knows’ this is incorrect.” It’s as you think that we really think that your “insights” here are worthwhile and substantive. We don’t. The greenhouse effect hypothesis has many, many problems. One of which is the problem of Mars, which you have, once again, been unable to provide an explanation for. (The paraphrased “I won’t answer until you understand the greenhouse effect” line is not an explanation, but an evasion.) Of course, your side prefers to focus on 95% CO2 atmosphere Venus, while simultaneously glossing over the pressure/density difference between Venus and Earth (92 times greater for Venus) and the fact that Mars also has a 95% CO2 atmosphere that is 100 times less pressurized than Earth’s – which is why Mars is so much colder despite having 950,000 ppm CO2. You can’t explain this, of course, so you try to evade answering questions about it. As a skeptic, I am entirely open to reading about explanations that might better explain how planetary heating/temperatures work. Unlike you, I don’t automatically dismiss scientific explanations for phenomena if they don’t initially conform to my presuppositions. So far, the adiabatic theory of the greenhouse effect (that does not assign a critical role for trace gases) is far more satisfying than the more popular CO2 greenhouse effect (that only became popular in the late 1970s). It’s exciting (for me anyways) to read about explanations that don’t have so many holes in them, as the CO2-climate explanation does. I’m not nearly as persuaded by the argument from authority (logical fallacy) as I used to be, and hence I am not as prone to have the merits of an explanation reduced to what journal a paper is found in, or the credentials of the authors. I’ll let the guardians and gatekeepers of the faith (and people like you) concentrate on that. Here are 3 more peer-reviewed papers on the adiabatic greenhouse effect. It (the theory) fully explains planetary temperatures, including Venus’ and Earth’s, without referencing CO2 as a significant contributor. You can spare us your attempts to denigrate the authors or their conclusions, as we don’t view you as someone who is more knowledgeable or who has more credibility than they. In fact, instead of replying to your attempts to defend the paradigm, I’ll probably just ignore what you write. I practically know what you’re going to focus on anyway (e.g., these authors don’t understand how the greenhouse effect works, the scientific community doesn’t agree, these scientists are “nutty”, etc.). Convection accounts for approximately 67% of the total amount of heat transfer from the Earth’s surface to the troposphere, the condensation of water vapour for 25% and radiation accounts for only 8%. As the heat transfer in the troposphere occurs mostly by convection, accumulation of CO2 in the troposphere intensifies the convective processes of heat and mass transfer, because of the intense absorption of infrared radiation, and leads to subsequent cooling and not warming as believed. … The analysis indicates that the average surface temperature of the Earth is determined by the solar constant, the precession angle of the planet, the mass (pressure) of the atmosphere, and the specific heat of the atmospheric mixture of gases. If the CO2 concentration in the atmosphere increases from 0.035% to its double value of 0.070%, the atmospheric pressure will increase slightly (by 0.00015 atm). Consequently the temperature at sea level will increase by about 0.01 °C and the increase in temperature at an altitude of 10 km will be less than 0.03 °C. These amounts are negligible compared to the natural temporal fluctuations of the global temperature. According to the adiabatic theory of greenhouse effect (see below), besides the Sun’s radiation, the main determining factors of the Earth’s climate are the Earth’s atmosphere pressure and its composition. The denser the atmosphere (i.e., the higher the atmospheric pressure), the warmer the climate. Thus, the high surface temperature at the ocean level during the Archaean time, at a low Sun’s luminosity, may only be a result of higher atmospheric pressure. The gradual decrease in the oceanic water temperature with a smooth increase of Sun’s luminosity may only be a result of a gradual decrease in the atmospheric pressure. The quoted comparisons indicate that average temperature distribution in the planet’s troposphere is completely defined by the solar constant, atmospheric pressure (mass), heat capacity of its gas composition and the precession angle. The theoretical temperature on Venus surface turned out to be Ts = 735 K, and on Earth’s surface, 288 K. The empiric values are 735.3 and 288.2 K, respectively. This close fit cannot be accidental and presents the convincing evidence in favor of the adiabatic theory of heat transfer in a dense atmosphere. If you stop looking at computer screens and all that hypothetical nonsense, actually look outside you can see this NATURAL process happening before your very eyes. The clouds show how the air mass expands as it rises. If it expands on the way up, surely it must be compressed at the lower levels? It is all that continual air mass movement, natures attempt at normalizing the temperatures across the globe, that drives the system. Simple mechanical air mass movement cools the atmospheric system, each air cell is not that dissimilar to a vortex cooling tube folded back on itself. If you do no agree maybe you have an better explanation. Remember that adding that CO2 will also have a very slight difference, in lowering the specific energy of the atmosphere. Thus counteracting the very slight pressure increase. Apparently, everything needs double and triple the amount of words, so you can understand what somebody wrote/said. The author used “everyone knows” … just mirroring his nonsense. Nevertheless, CO2 as causing net cooling regarding surface temperatures is pure nonsense. You don’t have to believe me on that one … believe everyone else who isn’t driven by some weird “CO2 can’t be whatever ‘they’ are saying it is” agenda. Unlike you, I don’t automatically dismiss scientific explanations for phenomena if they don’t initially conform to my presuppositions. You seem to automatically believe nonsense or at least use those papers as an argument against whatever it is you are against. Don’t tell me you are open to everything. You have a clear opinion about what is happening with the climate. Every post of yours shows that very clearly. If you do no agree maybe you have a better explanation. That’s not a closed system compression/expansion. The atmosphere on Earth gets heated from below and radiates towards space at the top. If you could instantaneously increase gravity with some kind of switch, you’d see some warming at the bottom from the initial compression. But you now have more energy in the system and that energy will not stay there since it’s not closed towards space. Is that too hard to understand? No seb, we KNOW everything you say is nonsense. We KNOW you have a FANTASY comprehension of physics and science. Heck you even FANTASIZE that CO2 causes warming of the convective atmosphere, but cannot provide one tiny iota of empirical proof. !! But you now have more energy in the system and that energy will not stay there since it’s not closed towards space. and that energy will not stay there since it’s not closed towards space.. Thank you seb, you have just said that the thermal gradient will allow any extra energy to escape. You have FINALLY FIGURED IT OUT..
Now you know why CO2 DOES NOT cause any warming of a convective atmosphere controlled by the gravity based pressure gradient. The physicist also calculates that CO2 may contribute at most about 36 degrees C to the temperature of Venus. Replace CO2 with N2, and the difference would barely be noticed. As you have constantly PROVEN, seb….. This is an SCIENTIFICALLY UNSUPPORTABLE statement. ie.. a scientific FANTASY !! That’s the whole point. Your reading comprehension is pretty poor. Warming is totally unrelated to CO2 concentration. Its difficult to reconcile the imagined massive effects CO2 is alleged to have on this planet’s climate when significant changes (in dust and clouds) can be precipitated by quasi-cyclic events (~100kyr) that are outside this planet. Spectral analysis of climate data shows a strong narrow peak with period ≈100 kyr, attributed by the Milankovitch theory to changes in the eccentricity of the earth’s orbit. The narrowness of the peak does suggest an astronomical origin; however the shape of the peak is incompatible with both linear and nonlinear models that attribute the cycle to eccentricity or (equivalently) to the envelope of the precession. In contrast, the orbital inclination parameter gives a good match to both the spectrum and bispectrum of the climate data. Extraterrestrial accretion from meteoroids or interplanetary dust is proposed as a mechanism that could link inclination to climate, and experimental tests are described that could prove or disprove this hypothesis. Examination of rainfall figures for a large number of stations shows that there is a tendency for more rain to fall on certain calendar dates than on others. There is a close correspondence between the dates of the rainfall maxima in both the northern and southern hemispheres, and this is difficult to explain on a climatological basis. The effect might, however, be due to an extraterrestrial influence. The rainfall peaks occur approximately 30 days after prominent meteor showers, and it is suggested that they are due to the nucleating effect of meteoritic dust falling into cloud systems in the lower atmosphere, the time difference being accounted for by the rate of fall of the material through the atmosphere. showing the MASSIVE BENEFITS of enhanced atmospheric CO2.